The Orbel Collection by Tech Lighting is inspired by Mid-Century modern art with contrasting geometric shapes. 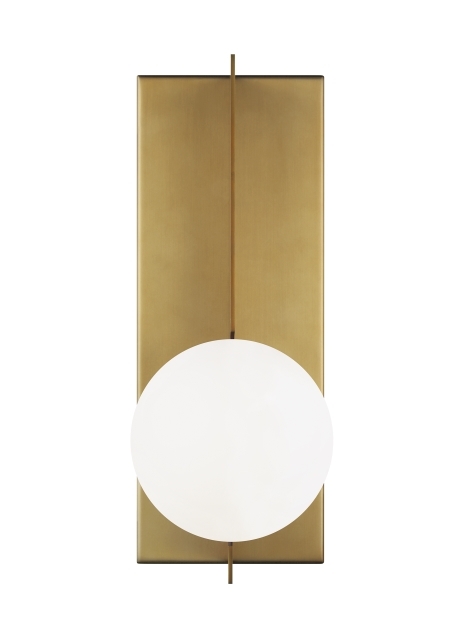 The Orbel wall sconce features an elongated metal rectangle that supports a frosted sphere of light. Designed at 13” tall and offered in three modern finishes, the wall sconce is a beautiful fixture to line your hallways or illuminate any room setting. Coordinate your design with other fixtures in the Orbel collection, such as the flush mount, bath light and low voltage pendants. Lamping options are compatible with most dimmers. Refer to the Dimming Chart for more information. Rated for (1) 5 watt max. G9 Bi-Pin lamp (Not Included). LED 120 volt 5 watt, 303 delivered lumens, 3000K, LED G9 Bi-Pin lamp. Dimmable with most LED compatible ELV and TRIAC dimmers. Mounts up or down.